A fruit crisp offers the luscious flavor of a fresh fruit pie without the fuss of making a crust. 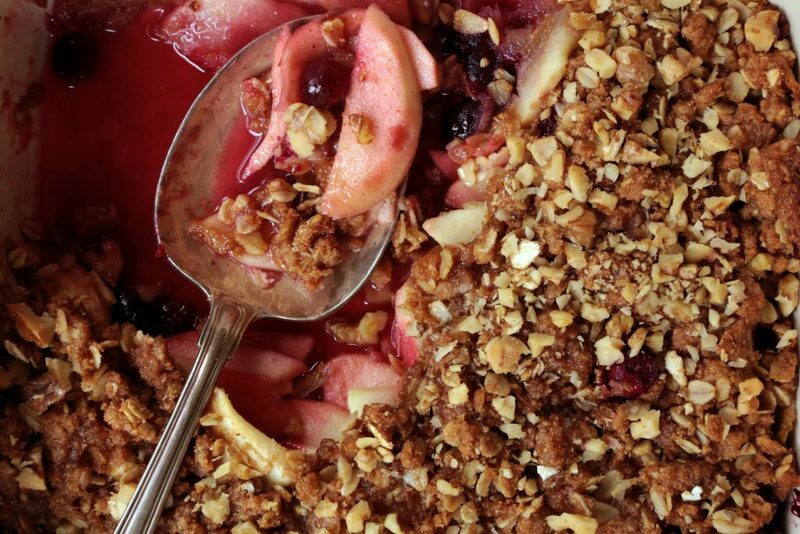 Celebrate the arrival of fall with this apple-cranberry crisp. The nut-studded topping works great with other fruit combinations too. Preheat oven to 375°F. Coat an 8-inch-square baking dish (or similar 1 1/2- to 2-quart dish) with cooking spray. To prepare filling, combine apples, cranberries and granulated sugar in a large bowl; toss to coat. Place the filling in the prepared baking dish. Cover with foil. Bake for 20 minutes. Meanwhile, make topping. Mix flour, oats, brown sugar, cinnamon and salt in a medium bowl with a fork. Add butter and blend with a pastry blender or your fingertips. Add oil and stir to coat. Add orange juice concentrate and blend with your fingertips until the dry ingredients are moistened. After 20 minutes, stir the fruit filling and sprinkle the topping evenly over it. Sprinkle with almonds (or walnuts). Bake, uncovered, until the fruit is bubbly and tender and the topping is lightly browned, 20 to 25 minutes more. Let cool for at least 10 minutes before serving. Serve warm or at room temperature.